Former Sen. Tom Daschle joins experts, practitioners to discuss role of technology and education in improving health care. Jonathan Spalter, Richard Katz, Lynn Goldman, Ivor Braden Horn and Jinha Park discuss mHealth in the Jack Morton Auditorium on Wednesday. From how we consume media to how we plan trips, smartphones have transformed nearly every facet of Americans’ daily lives. But does mobile technology have the potential to revolutionize the country’s health care system—by improving care, increasing access and reducing costs? 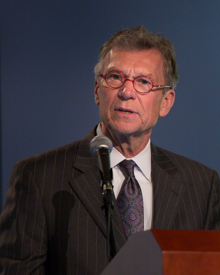 Former U.S. Senate Majority Leader Thomas A. Daschle, D-S.D. Sen. Daschle, who is co-chair of the Bipartisan Policy Center Health Project, was the keynote speaker during “A Conversation on mHealth: Improving Access and Outcomes for Patients through 21st Century Technology,” co-hosted by the George Washington University and Verizon. His remarks kicked off a morning of conversation in the Jack Morton Auditorium about the opportunities mobile devices can provide for practitioners and patients. With the implementation of the Affordable Care Act, millions of formerly uninsured men and women will have access to health care. But many will be unable to receive appropriate care because of where they live, Sen. Daschle explained. At the same time, an aging population means that there will be an even greater need for primary care doctors. Connected health—a model for health care delivery that uses technology to provide health care remotely (through video messaging, for example)—could help alleviate the blow of physician shortages and provide greater access to health services for all populations. School of Public Health and Health Services Dean Lynn Goldman said all those working in health care and public health are “bearing witness to an extraordinary age” of medicine and health. She cited Text2Quit, a mobile-based smoking cessation program developed by SPHHS Professor Lorien Abroms, as one of the examples of how researchers at GW are embracing mHealth. “Everywhere in the world, technology is creating opportunities and hope where none existed in the past, whether it’s in cancer radiology in large city hospitals or maternal health in impoverished and remote villages in India,” she said. However, the country’s legal and regulatory environments have not “kept pace” with the advancement of these technological innovations, Sen. Daschle said. Providers and patients of today are still grappling with the same issues experienced in the 1990s, such as inadequate broadband infrastructure. Telehealth, he said, should be “mainstream,” a regular option for patients. And in order to do this, the issue will have to be put on the national agenda. During the event’s discussion, moderated by Dr. Goldman, panelists discussed the most significant barriers to the development or adoption of these technologies, as well as solutions to overcome them. The panel featured Ivor Braden Horn, professor of pediatrics at Children's National Medical Center; Richard Katz, professor and director of cardiology at the GW School of Medicine and Health Sciences; Jinha Park, director of MRI and radiology research at City of Hope National Medical Center; and Jonathan Spalter, chairman of Mobile Future, a technology coalition. Dr. Katz has worked in mHealth for five years, helping to develop applications to modernize the doctor-patient relationship. He said that while mHealth will help to improve that relationship, the communication between a health care team and its patients must go in both directions. He also advocated for the creation of a better workflow model to organize and use information from the multitude of technologies. In the future, Dr. Katz said, a person’s collection of health care information from all of his or her providers—from a pharmacist to a primary care doctor to a specialist—could be interfaced in one central location. Dr. Goldman played master of ceremonies for a second event in the Jack Morton Auditorium on Wednesday. “Re-visioning of Education in Public Health” followed the morning’s panel discussion and addressed the challenge of how to best educate the public health leaders of the future. 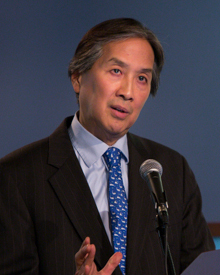 United States Assistant Secretary for Health Howard Koh. The event began with a presentation by Dean of the University of South Florida’s College of Public Health Donna Petersen on “Framing the Future: The Second Hundred Years of Education for Public Health.” The initiative, sponsored by the Association of Schools of Public Health, aims to reexamine public health education through engaged discussion and create a report of recommendations for the future of the field, which will be released next year. Pan American Health Organization Deputy Director Jon Andrus; United States Assistant Secretary for Health Howard Koh; and Rajiv N. Rimal, professor and chair of the GW Department of Prevention and Community Health, each weighed in on the key qualities of a public health leader of the future. They cited the need for great vision, valor and humility, as they spoke to SPHHS students in the audience. Dr. Koh emphasized passion, perseverance and interpersonal skills are necessary for a career in public health.